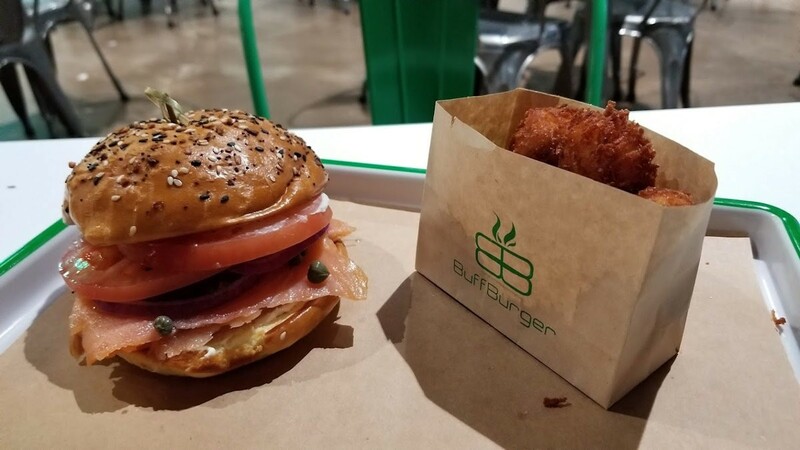 Smoked Salmon Breakfast Burger at BuffBurger. Photo by Hank Lewis. 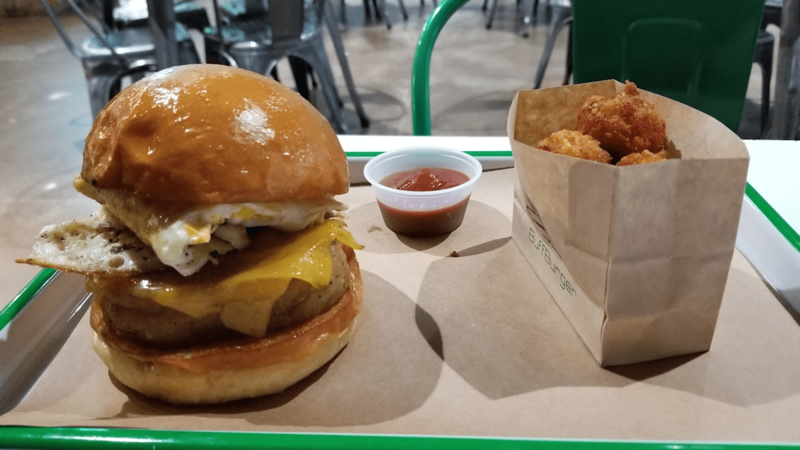 BuffBurger, the homegrown Houston burger chain owned by Paul “Buff” Burden and his wife, Sarah Morris Burden, recently rolled out a line of breakfast sandwiches for Houstonians on the go, as well as those who simply have time to enjoy a morning repast. To accommodate breakfast, BuffBurger locations now open at 7 a.m. daily. Like the lunch and dinner offerings, the breakfast dishes are crafted with local, natural and sustainable ingredients. Breakfast Burger with Sunny Side Up Egg. Photo by Hank Lewis. The morning menu has options for all tastes. For the beef lover, the Breakfast Burger features a 44 Farms beef patty cooked to order, American cheese, a sunny-side-up egg and bacon on a house-made challah bun. For those who love the “other white meat,” there’s a juicy Pork Belly Sandwich. 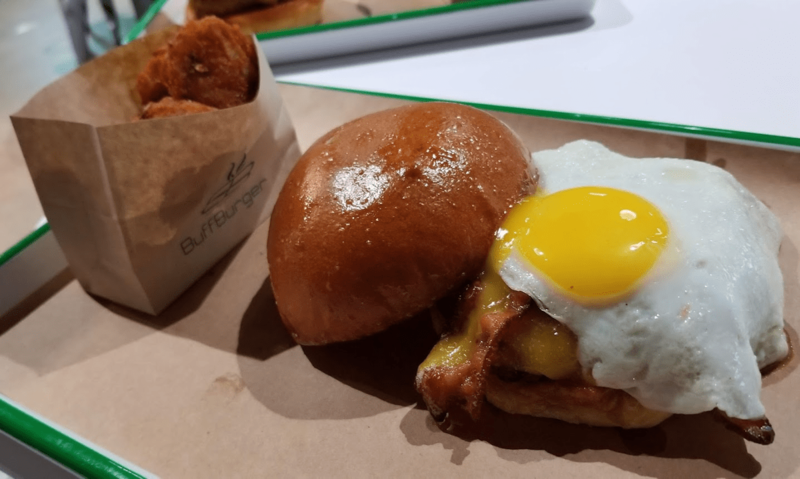 The slab of pork belly, which is also served on the challah bun, is cooked with the sous vide method for maximum tenderness, then joined by an over-medium egg, chives and cheddar cheese. Yet another meaty option is the Fried Chicken Sandwich with pepper jelly on a housemade buttermilk biscuit. BuffBurger’s Pork Belly Sandwich with housemade tater tots. Photo by by Hank lewis. Those who want something a little lighter might go for the Smoked Salmon Breakfast Burger. The salmon is smoked in-house and accompanied by chevre cream cheese, vine-ripened tomato slices, red onions and capers on a house-made Multi-grain bun. For purists, the Egg Sandwich —with soft scrambled eggs, chives, cheddar cheese, avocado, grilled onions and spicy mayo on a challah bun — might be just right. There’s even a breakfast sandwich for the kids: the Little Buff made with egg and/or bacon and served with milk or apple juice. Customers can also opt for the “in the Buff option” for any sandwich where the contents arrive wrapped in fresh hand-leafed lettuce rather than on a bun. As noted, all buns and biscuits are made in-house daily and a gluten-free bun is also available. All breakfast options are served with crunchy, housemade tater tots, and a special jalapeño ketchup is available on request. Breakfast hours are daily from 7 to 11 a.m. BuffBurger currently has two locations open at 1014 Wirt and I-10 near Memorial and at 1540 West Alabama and Mandell near Montrose. Breakfast is being served at the new 10550 Westheimer location near Westchase when it opens by the end of the year. Excited over having your new location in my neighborhood. Have not tried your menus before but it looks terrific and am anxiously awaiting the opening.